Well, I pulled the trigger today! Picked up the 215.30.44.21.03.001 from my local AD. It's is the blue-dialed, 43.5 mm Seamaster Planet Ocean with the 8900 movement. I gotta say it's a beast of a watch. Compared to my titanium Breitling Aerospace EVO (quartz), it's like comparing the weight of a Japanese 1 yen piece to a Double Eagle gold coin. Still, on my 7.5" wrist, it wears well. I'll post pics tomorrow when the lighting is better. I'm really liking the micro adjust bracelet (I have a mosquito bite on my wrist and the swelling makes my normal bracelets fit tight. It's a pretty watch and checks a box in my WIS journey. JoeC, TechGuyJ, Dark Overlord and 4 others like this. Congrats on the PO. The adjustable clasp is fantastic. Congratulations. I was going to say why settle for black if you crave the blue version. Great choice. And definitely get that vintage Omega serviced. You’re lucky to even have that opportunity. I would think it just needs a cleaning. Other then the electronic board and coil and a few other parts, the watch had a lot of the gears that a non quartz watch has and Omega serviced them (they were not throwaway movements), they were serviced like a mechanical watch. 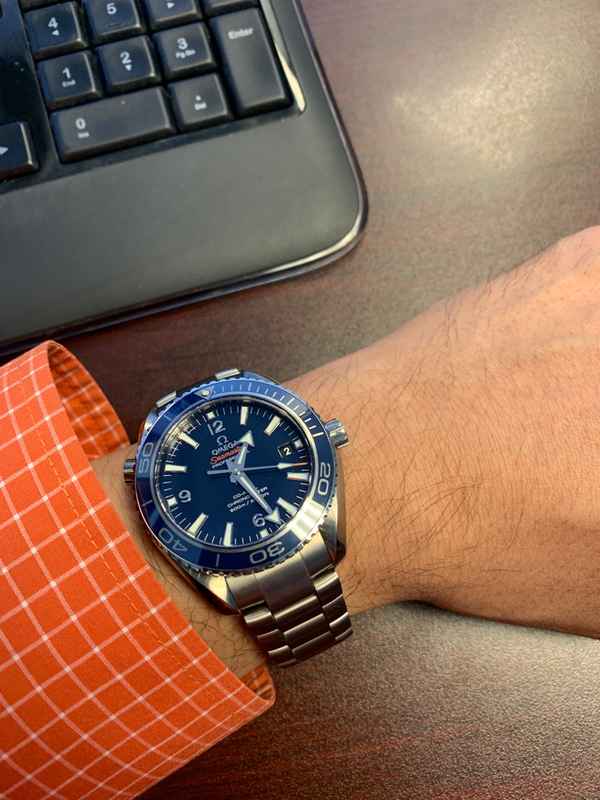 I agree with the other posters saying you should service your Dad's 1953 Seamaster ... if he balks at spending a couple hundred dollars to get it serviced, I doubt he would be happy that you spent more than 10X that amount on an entirely new watch for him. I think offering to have his old watch serviced is a wonderful gesture that reinforces the uniqueness and story of the piece that he already owns. I recently took my vintage Seamaster to a watchmaker, who estimated that it would cost about $300-$400 to service. That seems to be about the going rate. The blue is a keeper.